WTF: The ultimate crazy $40,000 handgun with 30mm grenade launcher. In appearance, Rico’s Signature Gun is reminiscent of the Holdt R4 Pitbulls from the first Just Cause, albeit larger. In terms of power the weapon exceeds the Pitbulls by far, making it a lethal addition to Rico’s arsenal. Note that the two bullets on the pre-order picture are the .454 magnum cartridge and the 30mm grenade for the underslung launcher. This suggests that this gun can shoot both rounds and indeed the Signature Gun appears to have an underbarrel grenade launcher, but sadly it can only fire the .454 magnum cartridge like a normal pistol/revolver in the game. Naturally, this has caused some controversy within the community. It is much more powerful than the standard pistol, and costs as much as a normal revolver, despite this, it is actually weaker than a revolver. It will kill grunts in two shots, though elites still require multiple shots to vanquish. 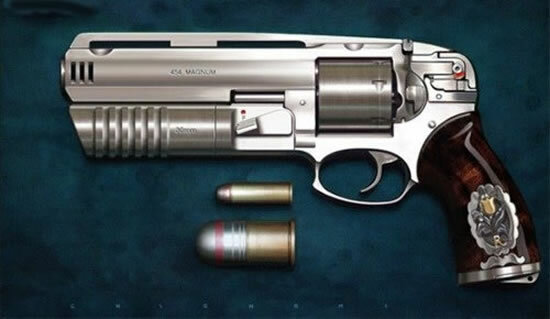 It can fire 6 bullets before a reload and when bought, the gun comes with 90 rounds in total. This equates to just over $444 per round. Bullets for this gun cannot be found throughout the game, so once out of ammo, the gun must be bought.